Apples, cinnamon, and brown sugar! Flavors that filled my favorite childhood breakfast, stove-top oatmeal. 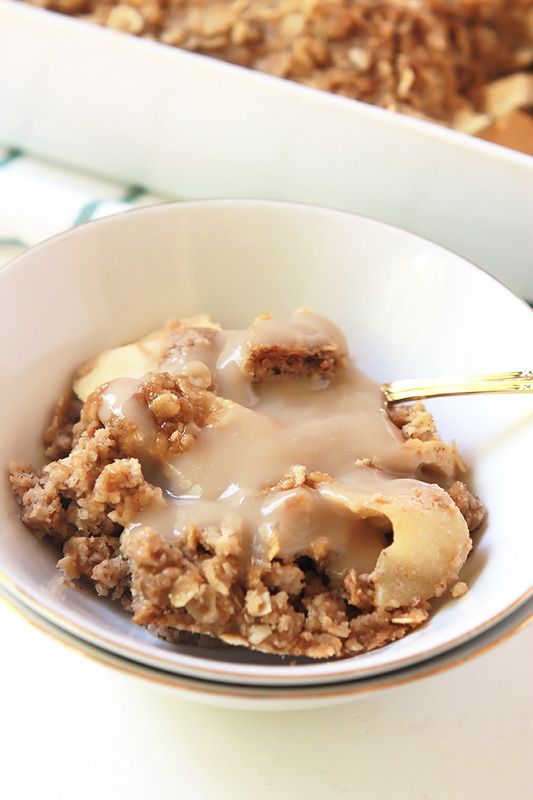 Today these same flavors are part of my new favorite make ahead breakfast, Apple Cinnamon Baked Oatmeal. When I was in elementary school my Mother decided to work the 11 to 7 shift at the hospital so she could be home when my siblings and I got home from school in the afternoons. I loved having my mother at home with us after school, but that meant she wasn’t at home in the mornings to make us breakfast. My father had that job and he had an interesting way of deciding what we would have for breakfast. Whoever made it to the kitchen first, fully dressed and ready for school got to decide what was for breakfast. On the days I made it to the kitchen first I always asked for oatmeal. So my father would make stove top oatmeal with brown sugar and cinnamon. Soon there was instant oatmeal packets with brown sugar cinnamon and dried apples. But let’s fact it the instant packet is nothing like the stove top version, and even better than stove-top is this baked version. Too bad my father didn’t know about baked oatmeal back then, would have saved lots of time. 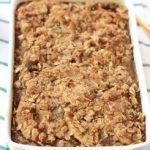 My daughter Taylor loves oatmeal just as much as I do, so I make this Apple Cinnamon Baked Oatmeal which makes her busy morning less hectic. Taylor actually takes a container of it to school and heats it up after her first class. She doesn’t like eating too early in the morning, she says it upsets her tummy, so this works perfect for her. 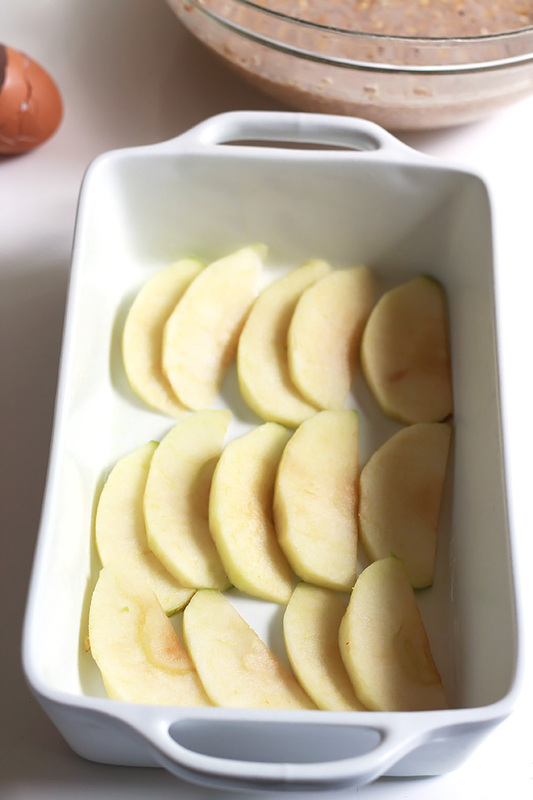 No need to prevent the browning of the apples when baking them with cinnamon and brown sugar. This is a great bake ahead dish, but if you don’t get to bake it the night before, you can still have it for breakfast, it’s ready in 22 to 30 minutes. If you want to make it extra special, while it’s baking you can make this delicious brown sugar sauce for a finishing touch. Pre-heat oven to 350 degrees and grease a 9×6 deep sided baking dish or 9×9 square dish with vegan butter, butter or coconut oil. In a medium bowl mix together oats, baking powder, cinnamon, nutmeg, and salt. Set aside. Pour milk into a large bowl, crack eggs one by one into a smaller bowl, before adding to the milk bowl. Whisk eggs with the milk until well combined. Add brown sugar and vanilla to milk mixture and continue to whisk until all sugar is dissolved. Pour dry ingredients into the milk mixture and mix until well combined. Line the bottom of baking dish with a layer of apples, pour about ¼ of mixture over the apples, continue to alternate layers of apples and oat mixture until you have used all oat mixture and apples. Place topping ingredients in a small bowl mix together using the back of a fork or your fingers. Sprinkle over oat mixture, bake oatmeal in oven 25 to 30 minutes or until top starts to turn golden brown. During the last 15 minutes of cooking time, whisk brown sugar sauce ingredients in a small sauce pan until well combined. Heat pan over medium heat, stirring until mixture starts to thicken, about 3 to 5 minutes. Transfer to serving dish and serve with oatmeal. Some additional toppings you may want to serve with oatmeal are chopped nuts, coconut flakes, raisins or any fruit of your choice. 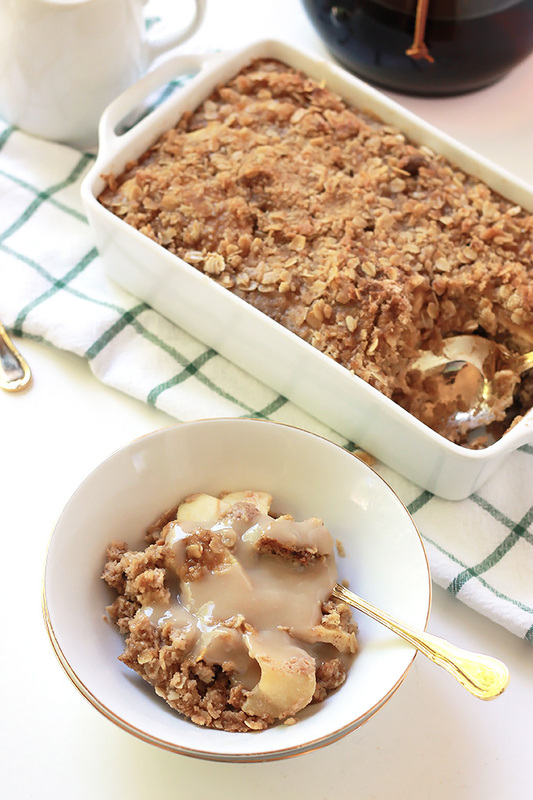 This Apple Cinnamon Baked Oatmeal is not only perfect for busy mornings, it’s also perfect for lazy weekend mornings when you are hosting guest. If you make this recipe or a version of it, take a picture and share with me on Instagram, tag it #thewholeserving or leave a comment below. 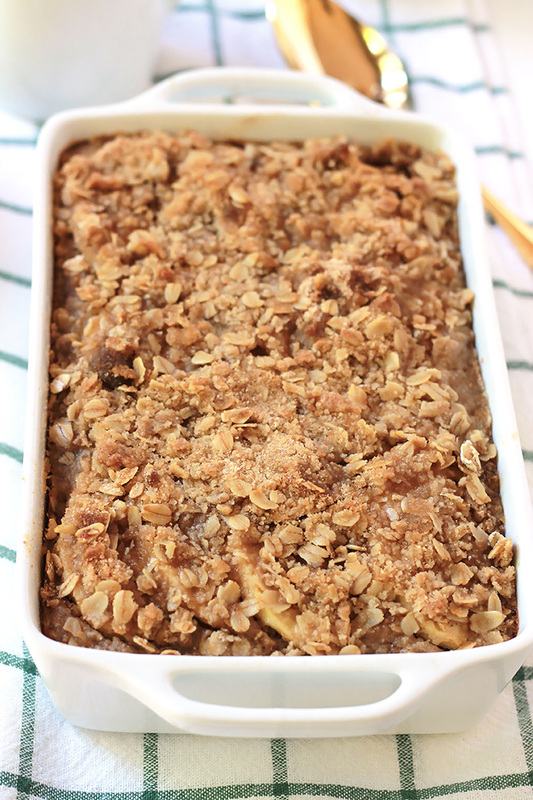 I’d love to see or hear about your version of Apple Cinnamon Baked Oatmeal. If you like this you may want to give this delicious Cinnamon Spice Granola a try. Wow, this looks wonderful, and the brown sugar sauce looks heavenly. I will have to make this for my family soon. Sherry hopefully your family will love as much as we do. The other night after working a very long day at my computer I had it for dinner. This looks amazing! I can’t wait to add this to my breakfast ideas. Thanks for sharing! I hope your family loves it as much as we do in my house. Oh- My – Word!!! 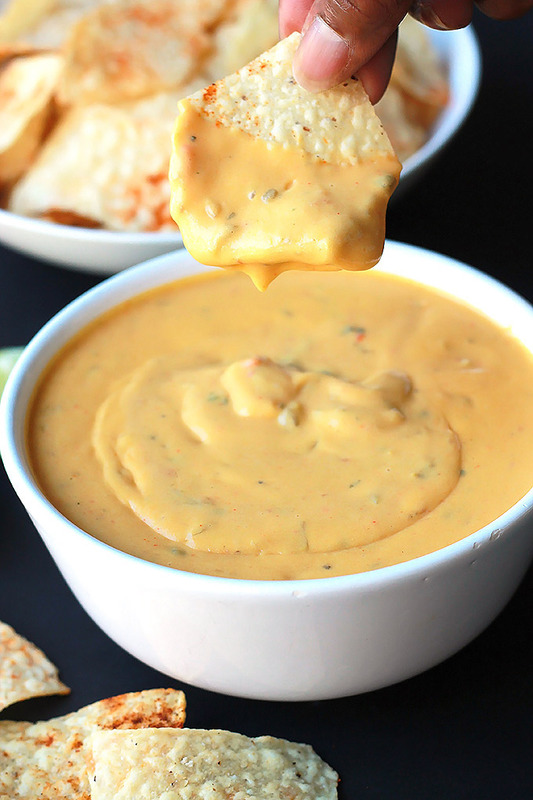 this looks amazing and your picture caught my eye and got my taste buds salivating when I saw it over at #WayWow linkup. We eat oatmeal in the am before we head out to Cross-fit — So quick question – I count my macros so does your nutritional info include the brown sugar sauce? or just the oatmeal portion? thanks so much – I can’t wait to try this out and so happy it can be baked ahead. Hi Debbie, The nutritional info is for the sauce as well. 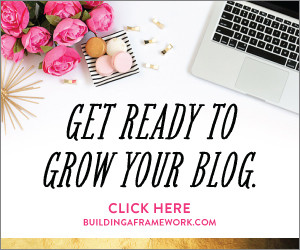 I use one from Food Blogger Pro member site. I hope it works for you. 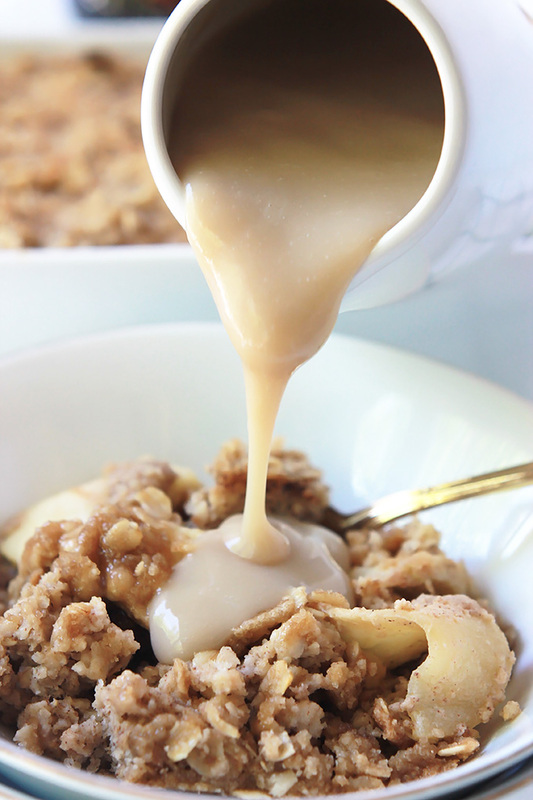 I LOVE oatmeal and with apples and brown sugar it is the best! I love that this is a make ahead recipe! The make ahead part is perfect for my busy schedule. I even had it for dinner the other night. Celeste..can I make this the night before and then bake in the morning??? You absolutely can, it’s a great time saver. You can never go wrong with apples, cinnamon and brown sugar! This sounds amazing! I’ll have to pin it so I can make it soon! Lisa that is so right, it has always been my favorite flavors to put together in my oatmeal. Hope you get a chance to make soon. Enjoy! What a great recipe. I almost makes me wish I was working fulltime again to bring this in to work. I know it would have been gone in seconds. Thanks Debra, I know what you mean about sharing food at work, that’s one thing I miss as well. Working from home all day every day I sometimes just share with my neighbors. This looks amazing! Perfect for the next time I have friends for brunch. Saved for later thank you! Nicole I hope you and your friends enjoy this the way me and my family does. It’s almost like eating apple pie for breakfast. 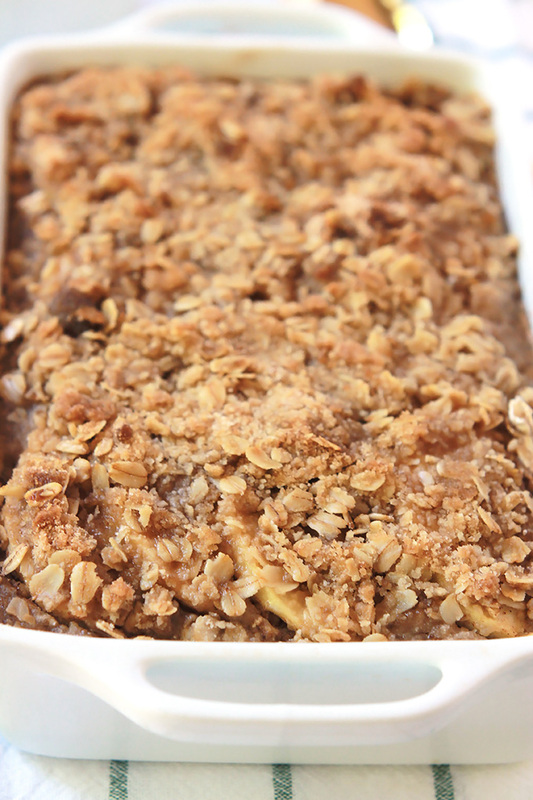 I’m intrigued by this recipe…it’s like apple crisp meets oatmeal pudding meets oatmeal bread. I can’t wait to try this, and your photos make this looks sooo delicious! Pinned! Ginger I like the way you describe this dish, it’s so delicious. Hope you are having a great week, thanks for visiting. Celeste, I am in love with this recipe. I know that oatmeal is a great way to start the day, but I’ve never been a big fan of the cooked oatmeal in a bowl with milk. Something about the consistency. But this is right up my alley. I think that the brown sugar sauce took it over the top, this will be made in my house soon. Not only could I have it for breakfast, but it would be a great lunch when I have a busy day. I could just pop this in the microwave warm it up for a great boost. You are in the group with many who don’t like the consistency, and I have to admit I don’t like oatmeal prepared to a mush myself. I like for my oatmeat to have texture and this one does. I have had this for a late lunch and afternoon snack many a day. Enjoy! 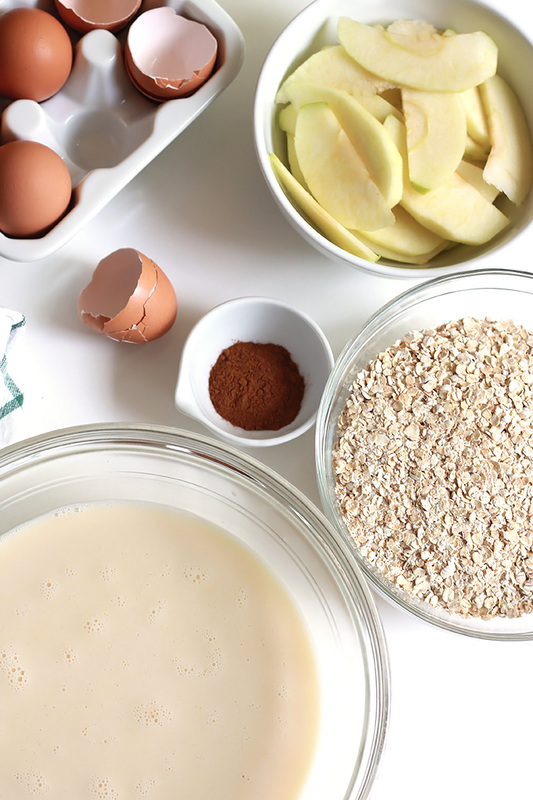 My hubby needs to eat more oatmeal so I have to try this yummy recipe with him. I am so delighted that you shared your healthy, homemade Apple Cinnamon Baked Oatmeal with us at the Healthy Happy Green Natural Party! I’m Pinning and sharing this! Hi Deborah, I hope your hubby enjoys this the way we do here in my house. Hi Erin, this dish is almost like having apple pie and oatmeal in one. Hope you have a chance to give it a try. Wow, does this sound good! Perfect for those chillier mornings. Pinned and tweeted. Thanks for sharing at Merry Monday, hope to see you again next week! Hi Chelc, Thanks for stopping by and thanks for sharing. Wow, this looks good! Pinning. Not sure if this should be breakfast or dessert! Visiting from Link Party Palooza. Hi Victoria, I think you can eat any time of the day, I have even had for dinner before. I hope you like it. Wow this looks divine! My husband is a huge baked apple anything kinda guy so I’m thinking this will make a great Fathers day treat for him. Thanks for sharing! Thanks Abigail, I hope your husband loves it and he has a very Happy Fathers’s Day. Thanks Amber, I look forward to the link up each week. I’m not sure what I did wrong but with 2 cups oats and the milk and eggs it was too liquidy and took way longer to get done. Did you use quick oats? Tastes great though! Hi Gloria, I will have to recheck and make sure I didn’t type the wrong amount of liquid. I’m glad you like it. I made this tonight, so my family can have it for breakfast throughout the coming week. I doubled up on everything in the recipe to make it go farther, and it seemed super soupy after stirring together the oatmeal mixture with the milk/egg mixture, so I added another cup of oats. That seemed to help, but it was still pretty runny when putting it in the baking dish. When baking it, I had to double the bake time. Maybe because of the doubled size. I had a taste before I stored it for the night and it is pretty tasty! Please let me know if something needs adjusted, so I will know for next time. Thanks for sharing!! Thanks for the information Susan, I will make it again and post the adjustments if needed and I will let you know. Thanks again for the information. This is already on my to-do list, but I have a relative who is gluten-dairy free. I thought it would fit until I clicked the pin and saw flour in the topping. I’m honestly clueless when it comes to being gluten free, any ideas on what to switch this with to make the topping GF? Hi Raychel, I’m glad you like the recipe, however, I would suggest using a gluten-free flour blend for your topping. One that I like to use is Bob Red Mills Gluten-Free Blend. Use only gluten-free oats. I like using coconut flour for this type of dish. That’s a great idea. Thanks Lynn for the suggestion. Old-fashioned oats (large flake) or quick-cooking in this recipe? Looks yummy! This looks yummy but the sugar content is so high!!! I think I will replace the brown sugar with brown rice syrup and agave. Love your idea of the brown rice syrup and agave replacement. Thanks for sharing. This recipe was Amazing! I added raisins with the apples for a little more punch. Delicious! This recipe was fabulous! I added dried cranberries and dried blueberries to the apple layer. I will definitely be making this again! Rolana I am so glad that you love this as much as we do here in my home. The dried cranberries sounds delicious. hi! do u mean kosher salt when u wrote sea salt for the oatmeal part? what shade of brown sugar should i use? and can i serve it straight out of the oven with the sauce? thanks! Hi Sylvia, I like to use sea salt because it is less processed and typically has more trace minerals than regular table salt, which is highly processed and has an additive to prevent clumping. Regular table salt also has added iodine that helps maintain a healthy thyroid. For my iodine, I add iodine rich foods to my daily diet. Foods like green veggies, sea vegetables, and cage-free eggs are just a few of the foods that have iodine. However, if you like you can certainly use kosher salt. For the brown sugar, you can use whichever is your favorite or what you have on hand, and serving straight out of the oven is a good thing, just allow it to cool slightly. Enjoy! I was wondering if I could prep this this the night before, Store it in the refrigerator, and bake it fresh in the morning? That is perfectly ok, I do that sometimes. Enjoy! Do you use regular oats or can you use quick oats? Hi Staci, I used regular oats in this recipe, but you can try using quick oats. This is incredible!! I made this with out the apples (none on hand) and now I have to stop myself from eating the whole thing lol. Thank you for sharing! Once it is baked, how do you store it? Does it require refrigeration? Hi Jennifer, once you bake it you can cover and store in your fridge. If I make this the night before, should the sauce be made the night before as well! Also, if made the night before, do you refrigerate it after cooking or leave at room temperature? Ashley I’m so glad you like this recipe. I recommend making the sauce the day you’ll be using it, however, you can make ahead and reheat. If you make the oatmeal the night before I would refrigerate. Enjoy!